Maurizio Cazzati is one of the lesser known names from the Italian 17th century. A number of discs include pieces from his pen, but very few are completely devoted to his oeuvre. One of the reasons could be that in later times he was pretty severely criticized. Anne Schnoebelen, in New Grove, writes: "The judgment of early historians (e.g. Fétis and Torchi) has been hard on Cazzati as a composer, and indeed at best he can only be considered a composer of ordinary inspiration." In his own time he was involved in a debate which was caused by one of his masses that - according to his critics - included serious errors. However, it did not stop his music finding wide appeal: in his liner-notes to the present recording Rodolfo Zitellini states that "[he] was the most prolific printed composer of the whole century: 66 first editions (more than 100, counting reprints)." Cazzati was born in Luzzara (today Lucera), near Reggio nell'Emilia, part of the duchy of Guastalla. Here he was appointed as organist at S Pietro at the age of 17. He was ordained a priest and then acted as maestro di cappella in several cities: Mantua, Ferrara and Bergamo. In 1657 he moved to Bologna, where he became maestro di cappella of the Basilica S Petronio. Only two years later the debate I already referred to started. It was initiated by Lorenzo Perti, a beneficed priest at S Petronio, later maestro di cappella of Bologna Cathedral. Anne Schnoebelen assumes that this controversy divided the whole community: Cazzati did not become a member of the Accademia Filarmonica which was founded in 1666. Although he initially enjoyed the support of the vestry board of S Petronio he was dismissed in 1671 and returned to Mantua. Here he acted as maestro di cappella at the Cathedral and maestro di cappella di camera to Duchess Anna Isabella Gonzaga until his death in 1678. One of the notable aspects of Cazzati's activities is that he took the printing of his music into his own hands: during his time in Bologna he had a printing press in his official residence. He continued his activities in this field in Mantua. A number of collections of his music don't bear the name of a publisher which suggests that he himself had printed them. His output is large: 48 collections with an opus number include sacred vocal music and ten comprise secular works. In addition he composed several operas and oratorios, which have all been lost. His main contribution to music history is his instrumental music: between 1642 ans 1670 ten collections of sonatas and dance music came from the press. In his oeuvre we find a development from ensemble sonatas in the Venetian tradition to pieces which are divided into separated movements. In this respect he is a link between the early 17th century and Corelli's trio sonatas. Cazzati also was the first Bolognese composer who published sonatas for violin and bc. Even more important are his sonatas for trumpet and strings. Trumpet playing had a long tradition in Bologna but Cazzati considerably contributed to the city's becoming a centre of composing for trumpet and strings; later representatives of this tradition were Perti and Torelli. This disc focuses on one collection of sacred music, the op. 36, which came from the press in 1665 under the title Messa e salmi. It comprises a mass, a Magnificat and six psalms. 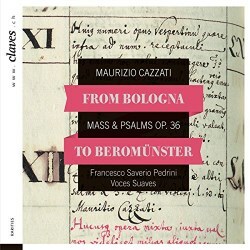 The title of this disc refers to the venue where Cazzati's music was recorded: the collegiate church of St Michael in Beromünster in Switzerland. The decision to record this music here is inspired by the fact that a copy of the op. 36 appears in the inventory of the music archive of this church from 1696. The archive has been lost but the inventory shows that Cazzati's music was once part of the repertoire of the church. An additional factor of importance is the presence of an organ, built in 1692. It is used here to perform the basso continuo - the singers and players are around the organ at the balcony - and to play the two organ pieces by Sebastian Anton Scherer. The latter was a composer from southern Germany, who worked in Ulm and whose organ works show the influence of the Italian style. This disc includes the largest part of the op. 36; only some of the psalms have been omitted. I am wondering why that is the case, considering the modest playing time of this disc. In her article in New Grove Anne Schnoebelen states that modern scholars have a somewhat different view on Cazzati: they recognize his importance for the development of instrumental music and "his melodic gift in solo vocal music". That comes to the fore here as well. One should not expect any remarkable specimens of text expression or experiments in harmony for the sake of expression. This is nice music to listen to and it is understandable that it found a wide appeal. There is also much variety thanks to the mixture of traditional elements and traces of the style of the time as well as contrasting scorings within single works, for instance from one verse to the other. The performers have found the right approach. These are good, straight performances, with fine voices and excellent instrumental playing. The text is clearly audible, which is especially important as the booklet omits the lyrics. This is not indispensable music, but it is well worth hearing. A valuable addition to the catalogue.